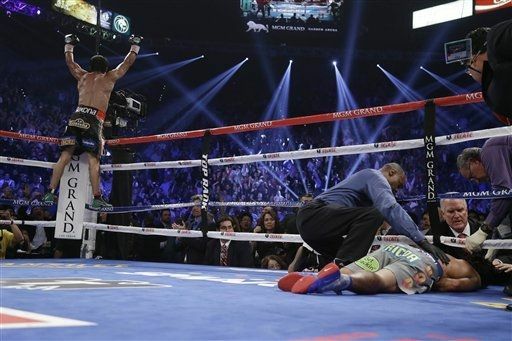 MANNY PACQUIAO Vs. JUAN MANUEL MARQUEZ 4 = WATCH THE EPIC FULL FIGHT HERE! | SyNaMATIQ = "Cin·e·Mat·ic"
MANNY PACQUIAO Vs. JUAN MANUEL MARQUEZ 4 = WATCH THE EPIC FULL FIGHT HERE! This entry was posted in Boxing, Celebs, Exclusive, Juan Manuel Marquez, Manny Pacquiao, sports, Uncategorized, Video and tagged Boxing, Daily Motion, Full Fight, Juan Manuel Marquez, Knockout, Manny Pacquiao, Pacquiao Marquez 4, Pay-Per-View, sports, Video by Synamatiq. Bookmark the permalink.